Dr. Thompson is a man of incredible wisdom he have inspired and trained myself and many young ministers to preach the gospel. I am proud to have him as my father not only spiritually, but naturally. Decisions are the things we are faced with on a daily basis. Dr. Thompson has the proclivity to tap into the depths of the problem and come up with an answer that is mind blowing. We style him as Dr. Wisdom. Thanks Dad for your incredible knowledge this book is a Wow! Just read it. There is not a day that goes by that we are not faced with a Decision, most of which we are challenged by and are in need of professional counsel. Dr. T.G. Thompson helps us to gain access to the best life possible and he gives positive insight for making better decisions. The Joy of Making Right Decisions is a person formula for success and fulfillment. Dr. T.G. Thompson opens the door to much needed wisdom and experience thats lacking in this generation and provides information that can revolutionize its readers mind forever. 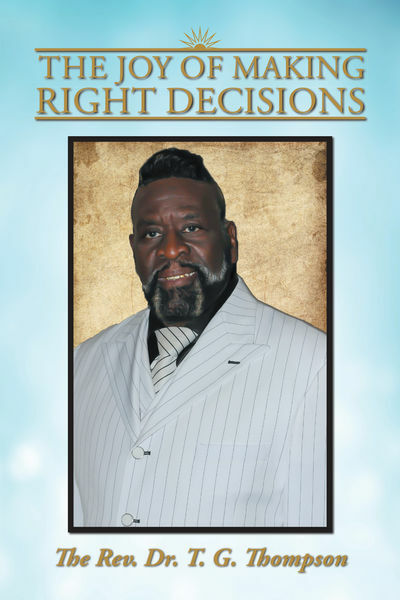 Get ready to elevate, expand and enlarge your capacity for making better Decisions because the answers that you need are all in this astonishing book, read it and be blessed.